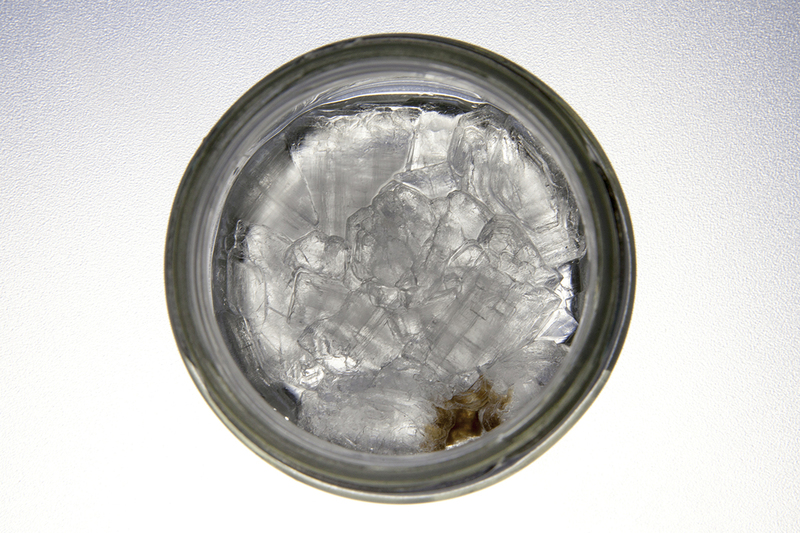 Piezoelectric Crystals produce energy when mechanically stressed, distorted or twisted. 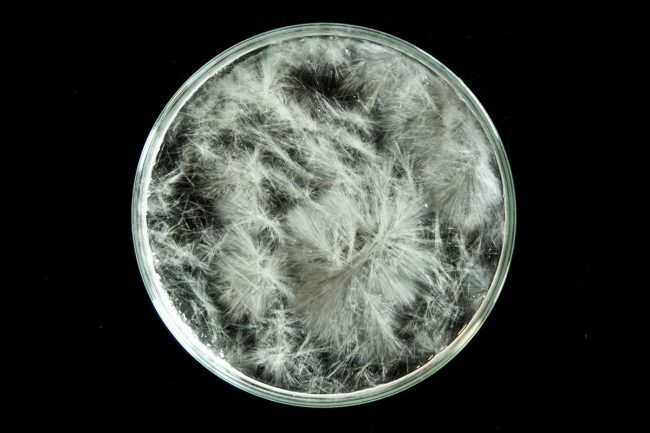 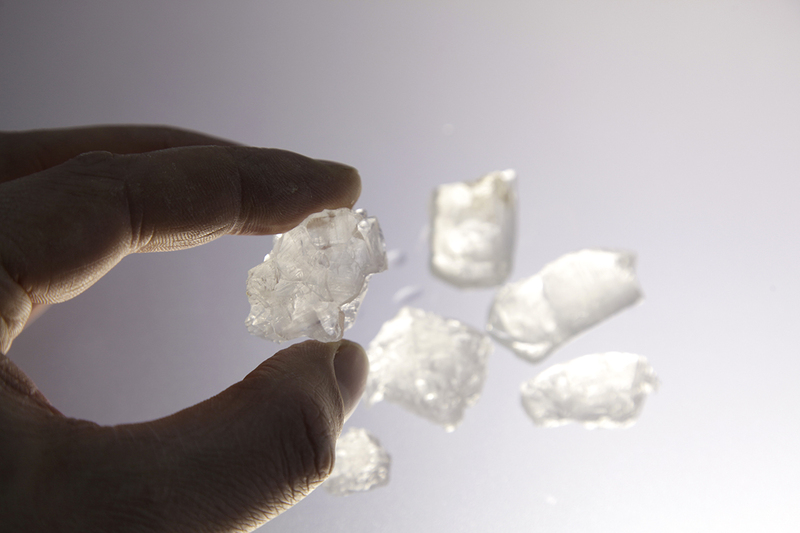 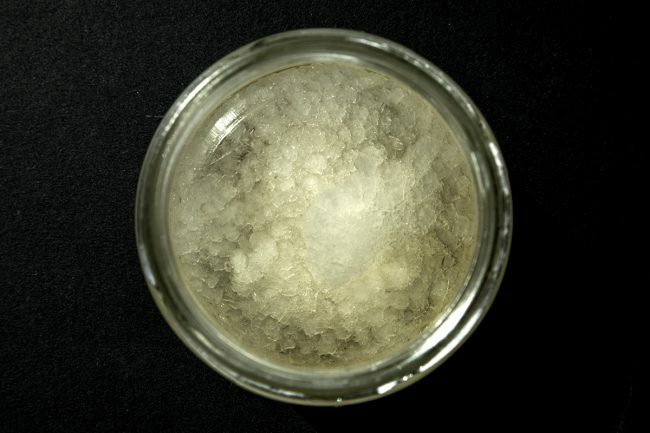 The following instructions describe how to grow Rochelle Salt crystals, which can produce a comparatively large voltage upon compression and which are one of the first known natural materials found to exhibit piezoelectricity. The tutorial is based on instructions found on rimstar.org. 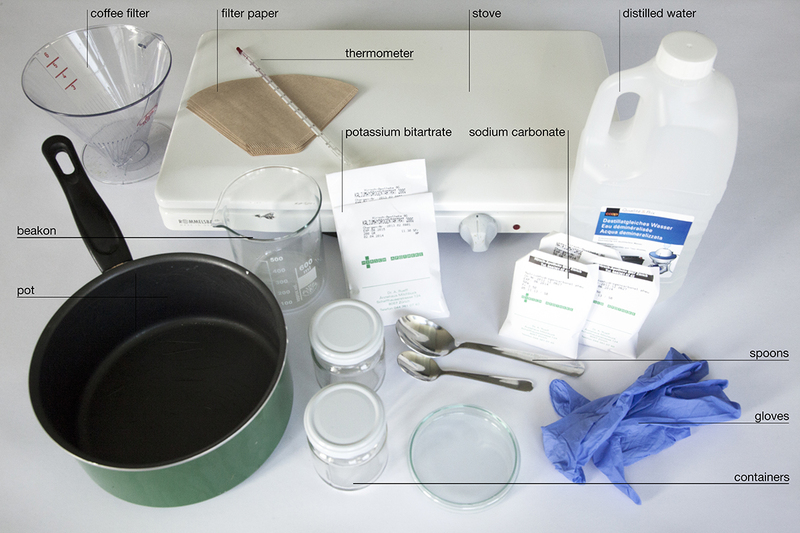 The first step is to convert the sodium bicarbonate into sodium carbonate. If sodium carbonate has been acquired in the first place this step can be skipped. 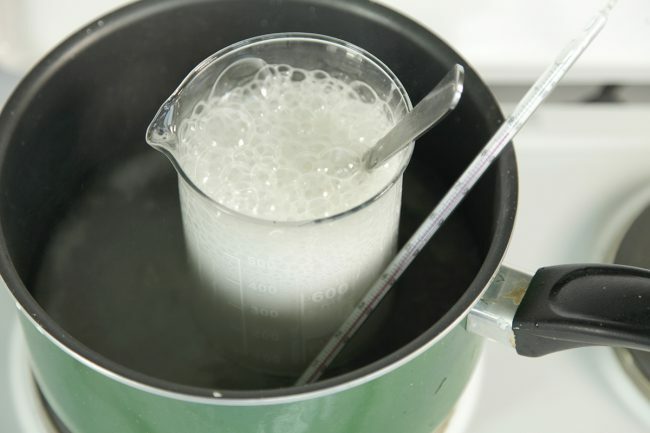 For the transformation the hydrogen of the Sodium Bicarbonate has to be removed. 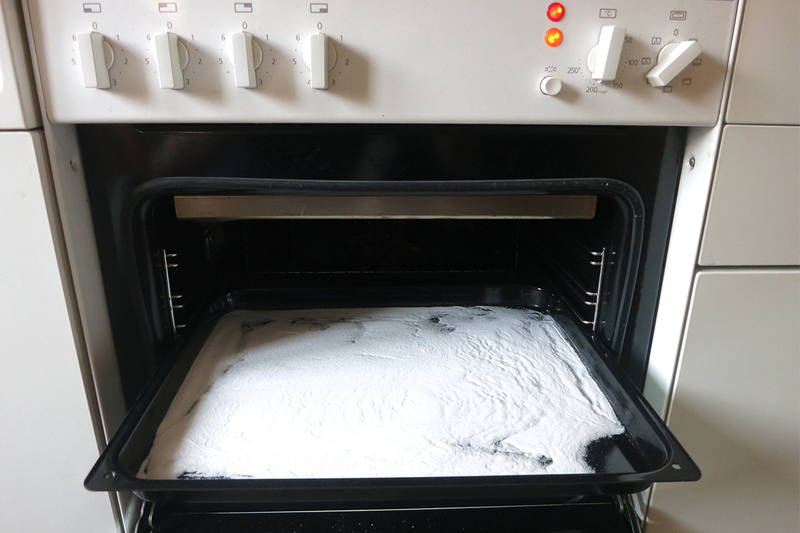 This is done by spreading the powder onto a baking tray or similar and heating it in the oven at 150°C for at least 1 hour. Occasionally the powder should be stirred to guarantee equal heating. 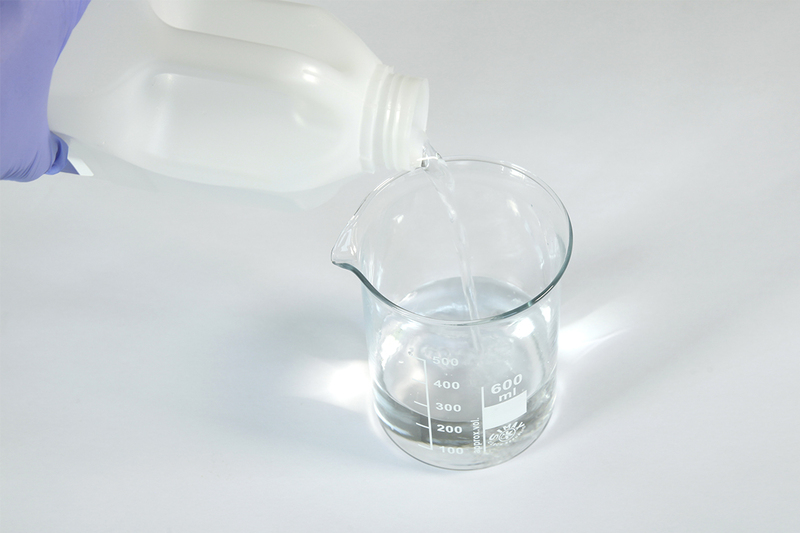 200g of potassium bitartrate are slowly mixed into 250ml of distilled water. The solution has to be thoroughly stirred during all times so that all particles are equally dissolved and no sediment occurs on the bottom of the beaker. 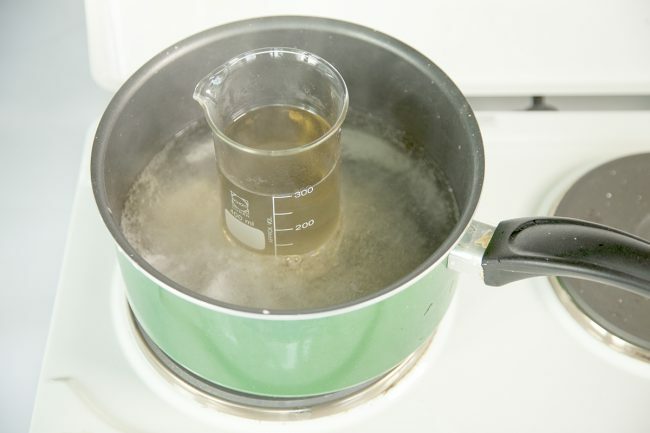 The beaker needs to be placed inside a pot filled with 2cm of water. 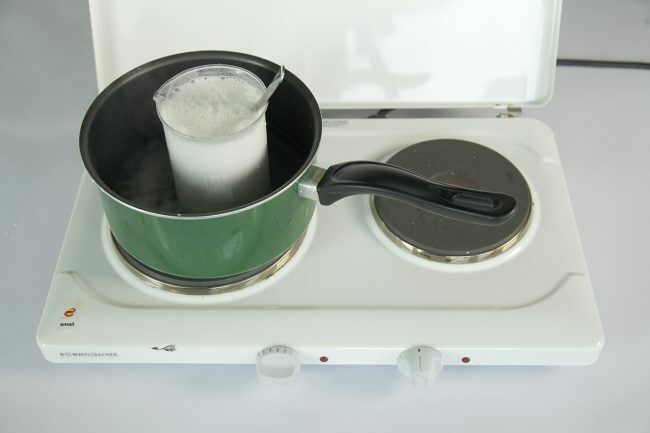 The pot is placed on a stove and slowly heated to about 80°C or until the water starts simmering. 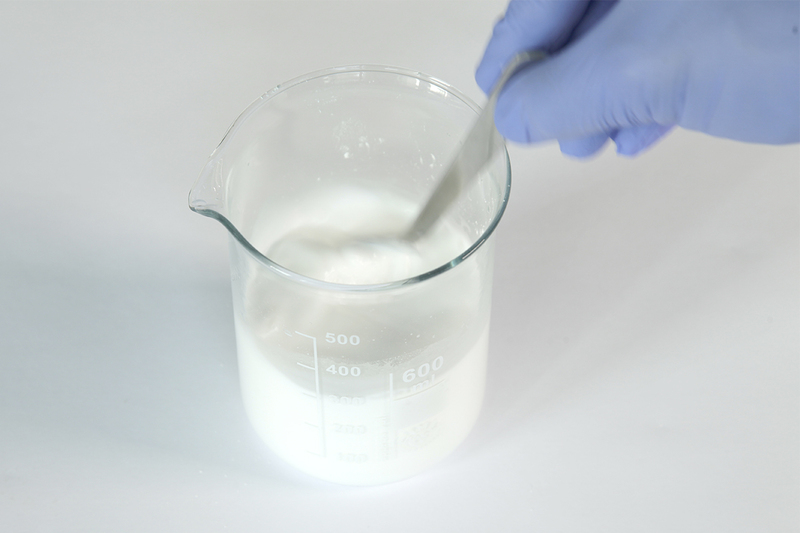 While the temperature is kept constant a half teaspoon of sodium carbonate is added to the solution while stirring it. The solution will fizz and bubble and continuous further stirring is essential. 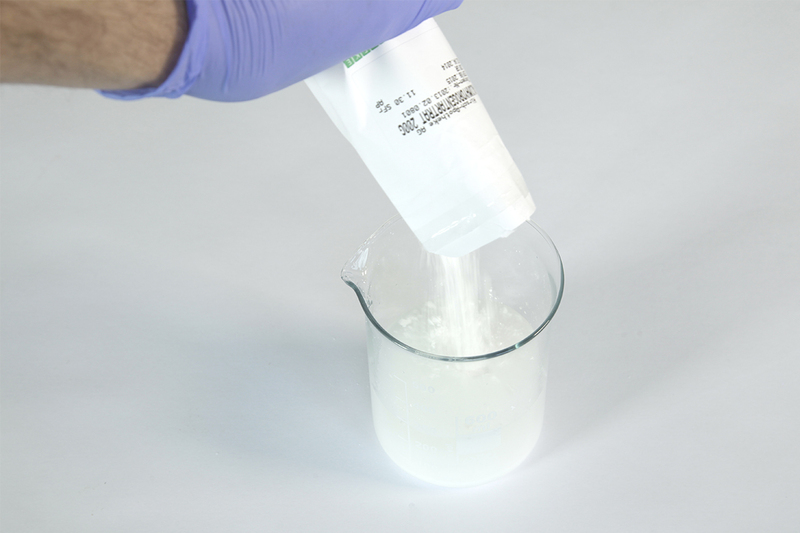 This procedure is repeated until no more bubbles occur when adding the sodium carbonate and the solution has turned yellowish clear. 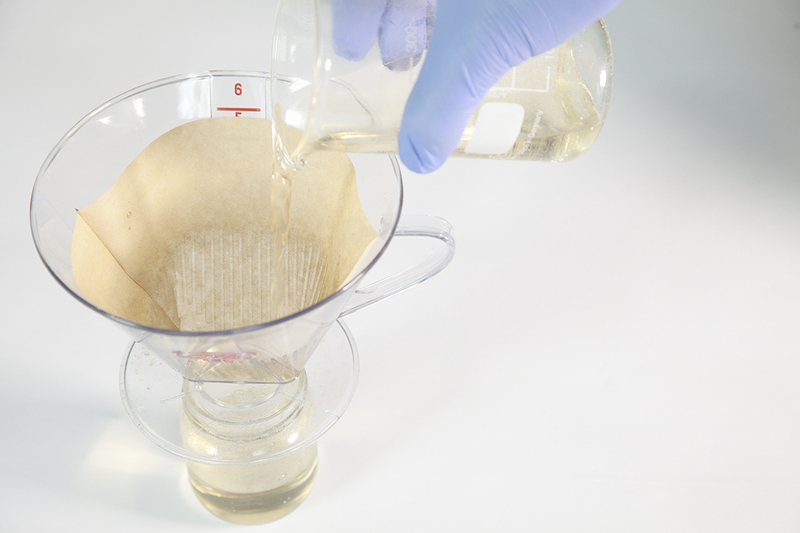 While still hot the solution is poured through the coffee filter into another beaker of the same size. 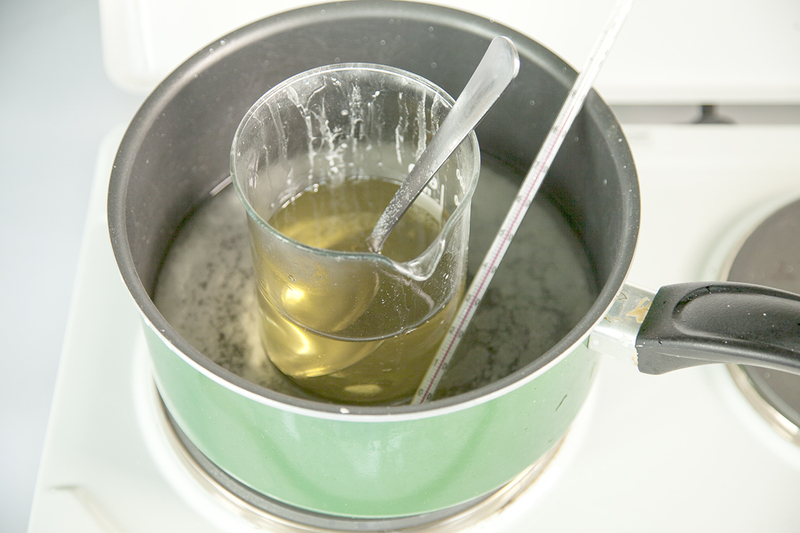 The beaker is placed back onto the stove and heated further to evaporate some of the solution and concentrate it. It is then filtered a final time and poured into clear containers which are closed with the lid. 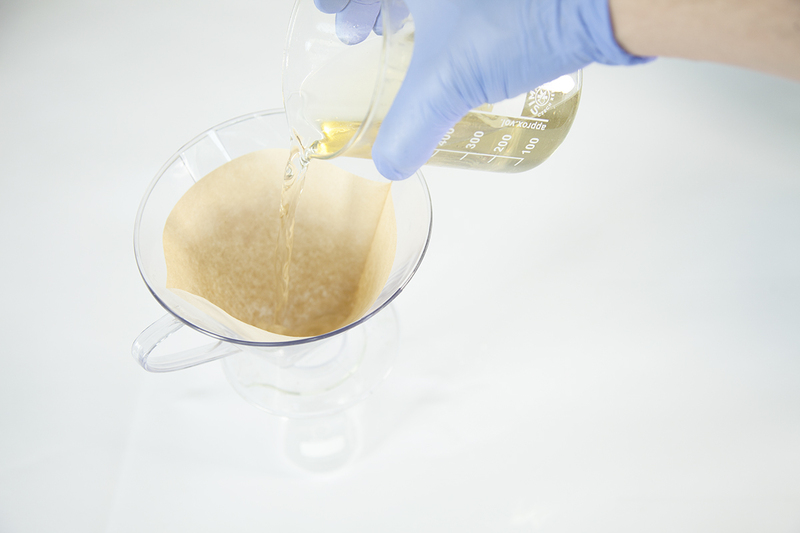 The mixture then needs to be kept in a cool place for several days. 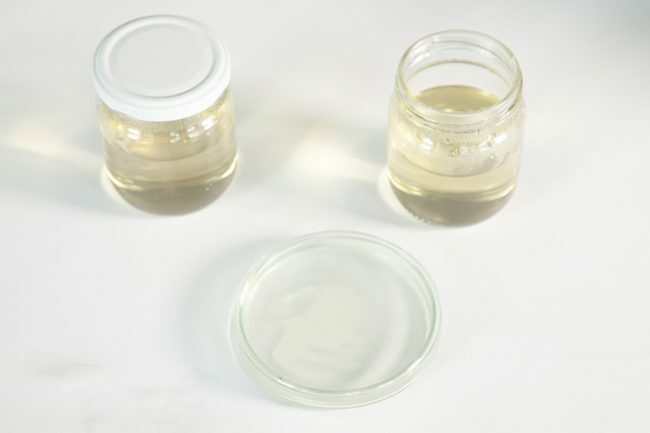 From left to right: one day, one week, ten days. 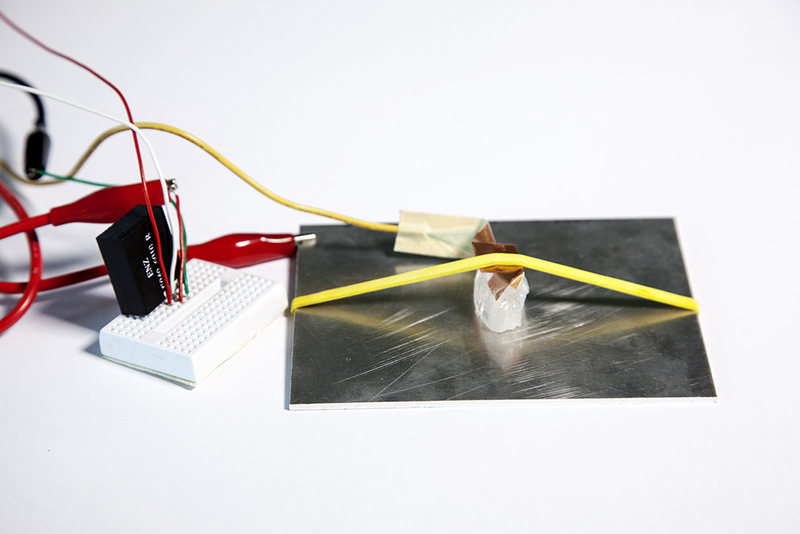 When connected to an EL-Driver, which converts 12V DC to 140V AC at 400Hz, the crystal emits an audible humming sound.